I didn’t think I’d really care about what happens with the GOP (Republican) race in the US, but the reality is that there is one candidate that makes sense to me: Ron Paul. And there’s something that doesn’t make sense to me: the coverage (or lack thereof) of this candidate and the other candidates being presented as the most likely to win. How did Gingrich win South Carolina when he couldn’t even ‘pack’ a staged event? The mainstream media wants to pretend he doesn’t exist and the GOP is engaging in vote fraud (what else is new, Bush 2000, Bush 2004) to ensure that either Gingrich or Romney win the Republican title. CNN in the US has completely dropped Ron Paul from the list of Republican candidates, possibly because some of the people with CNN are married to the military establishment, but possibly because Ron Paul simply sends a message that they don’t like. Ron Paul is the leader, fighting it out with Romney. Gingrich is a distant third. What’s important is the lack of fair coverage with the likes of CNN. The question is why? Why would they risk any journalistic integrity that they purport to have and avoid coverage of this viable candidate. Follow the money. Many of the key players are the establishment that Ron Paul wants to do away with. Anderson Cooper, ex-CIA, is also a member of the prestigious Vanderbilt family which, along with JP Morgan, Rockefeller and others, pushed the US into reviving the Federal Reserve. Under Ron Paul, many supporters hope that the military would face severe cuts (although this remains to be seen). CNN reporter Gloria Borger is married to Lance Morgan, influential employee with Tate Powell, a lobby group in Washington. Tate Powell also happens to represent the US military, US Chamber of Commerce and dozens of other organizations that wouldn’t be in favour of big cuts to the pork-barreling politics that is the US government today. Now, I don’t really care about all of this, but I feel it’s important for people to understand that there are bigger things at play when it comes to what’s happening in US politics. What I am truly bothered by is how the CBC trundles along with all of this crap and reports on how Ron Paul is a nobody and he’s ‘fading’. 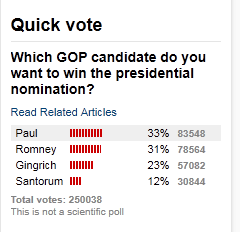 If you look at the poll above, Paul is IN THE LEAD with popular vote, not fading. Why would the CBC ‘shape news’ like this for Canadians when they have nothing to gain from it? The only clue available on the links above is that the story is regurgitated from the Canadian Press, Canada’s for-profit propaganda source owned by Bell and others. Perhaps they have everything to gain from unending war from the US?